Found by the warm Caribbean Sea and a stunning stretch of white-sand beach, Secrets The Vine Cancun is a stylish, adult-only haven. Perfectly combining natural beauty with untapped luxury, this world-class resort is the ideal place to enjoy the Yucatán Peninsula. Experience dedicated room service and elegant furnishings when you retreat to your room or suite after a day by one of three sun-soaked swimming pools. Experience the underwater world with a scuba diving session, or stay on land and join in a wine tasting or cocktail class. You can dine on a diverse mix of global cuisines at this hotel. Choose from succulent grilled steaks, delicious Asian dishes, fine Italian delights, and fresh seafood with a selection of premium brand drinks. There's dazzling entertainment to enjoy on an evening, or you can simply sit back and unwind in one of the several hotel bars and lounges. For a luxurious stay in one of the world's most beautiful destinations, try Secrets The Vine Cancun. This luxury hotel has a buffet restaurant, cafe, six a la carte restaurants, seven bars, three infinity pools, outdoor whirlpool, fully-equipped fitness centre, and spa. 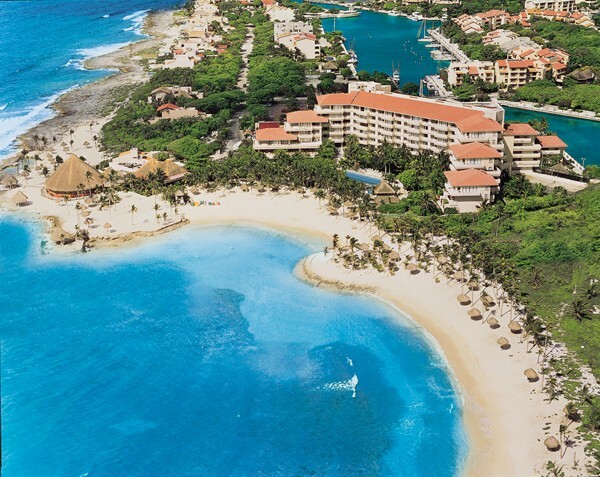 You can also enjoy tours and excursions, complimentary green fees, concierge service, and complimentary Wi-Fi. Secrets The Vine Cancun has both a la carte and buffet dining venues offering a range of international cuisines. Market Cafe is the hotel's stylish buffet restaurant, while Dragons Oriental Dining features a tasty Asian menu. Bluewater Grill serves succulent meats and Nebbiolo Ristorante is the property's elegant Italian venue. Enjoy a mix of Mediterranean dishes at Olio and fresh seafood at Sea Salt Grill. Try Barefoot Grill for a variety of delicious sandwiches at lunchtime, or The Vine Bazaar cafe for a selection of coffees and pastries. The hotel also has a choice of bars including a wine bar, beach bar, lobby bar, piano bar, sports bar, and two pool bars. Secrets The Vine Cancun also hosts live entertainment and themed parties. This hotel offers plenty to do on-site. There are facilities for beach and pool volleyball, table tennis, water aerobics, yoga, and football. Guests also have mixology and cocktail classes, dance lessons, wine tastings, deep sea fishing, and scuba diving to enjoy. Complimentary green fees for nearby Playa Mujeres Golf Club are available. Separate charges may apply for some activities. Secrets The Vine Cancun has 495 stylish guest rooms and suites with Italian porcelain floors and teak wood furnishings. All rooms and suites feature: private terrace or balcony, 42-inch satellite TV, tea and coffee making facilities, minibar (refreshed daily), alarm clock (with iPod/iPad docking station), chaise longue or sofa, bathrobes and slippers, complimentary Wi-Fi, iron and ironing board, vanity mirror, air-conditioning, hairdryer, telephone, electronic safe, and 24-hour room service. Guide price is per person. Based on 2 people sharing for 7 nights on All Inclusive. Flying from regional airports. Year round departures. Overseas transfers are available.